What a day it was at RBC GranFondo Whistler 2018! There were thousands of cyclists riding up the Sea-to-Sky highway, cow-bell deafening finish line cheers, helicopters filming from above, and a rock concert post ride party. On top of all of the fun and glory, riders also had the option to donate towards Cycling BC in support of growing youth participation in cycling and inspiring kids to live healthy lives. 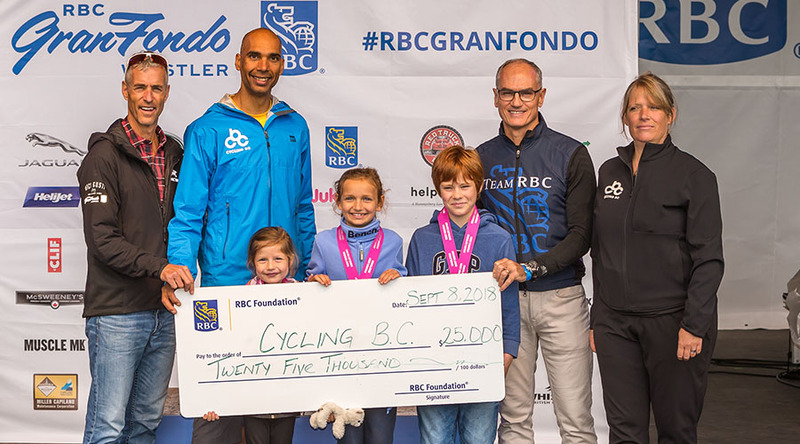 The RBC Foundation has generously matched rider donations and have donated a total of $25, 000 CAD towards Cycling BC. RBC is committed to inspiring and fostering the next generation of cyclists. The iride Jam which was run with the help of Cycling BC on event day in Whistler was a big hit for families. Focusing on our youngest cyclists the program teaches kids six and older the basics of cycling skills and safety in a fun environment. Also popular amongst families this year was the brand new Medio 55km route which started and ended in Whistler. The new route had cyclists ride southbound down the Sea-to-Sky highway from Whistler and up the scenic Callaghan Valley before looping back to Whistler for a grand finish amongst the Gran Fondo riders. The new Medio route is a great ride for families to do together as well as first time Gran Fondo riders who don’t want to attempt the full distance just yet. Plus, in 2019 we are offering special Medio pricing! Keeping with the theme of inspiring the next generation we are once again offering a substantially discounted entry to riders under 19. The entry is open to any category at a price of only $50.